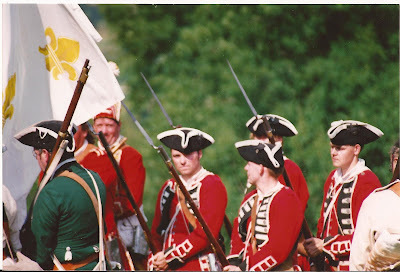 Well worth reading is this article on the battle of Fort Frontenac. He posts an order of battle which might make a well proportioned wargames army. Interesting to note they are mostly all American and accustomed to canoes - the regulars were from Captain Ogilvie's Independent company. 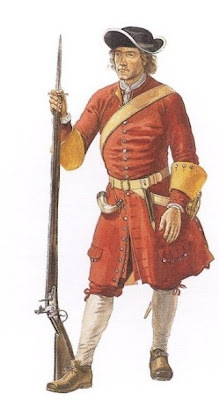 This is a cool blog by Nathan Kobuck - covering Native and longhunter stuff from the 1760s - lots to read - he investigates the blanket coat in the Revwar here. 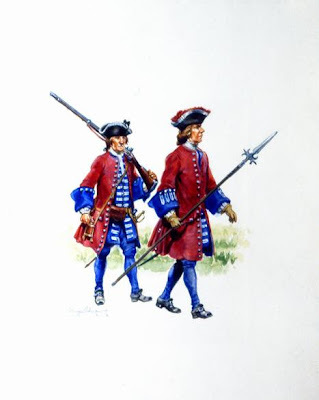 I've enjoyed checking out the new figures in Conquest's French and Indian war range - some excellent French regulars and a couple of Jesuits and these, my favourites Natives in Winter dress - ideal for a snowshoes type skirmish. 28mm of course. I really enjoyed the below clip - nicely framed and set - made me dig out another Compagnies franches de la Marine image from the late 90s - I am second from right. Good days. 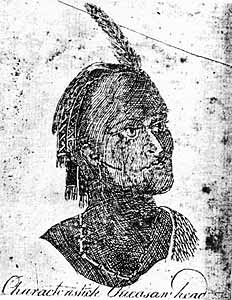 A sketch of a Chickasaw by Bernard Romans, 1775. An observer called Red Shoes is quoted as saying 'that our troops heavily clad marched with too slow a step and so close together that it was impossible for the Chickasaws to fire without killing some of them and wounding several.' An end to French ambitions in the southeast. 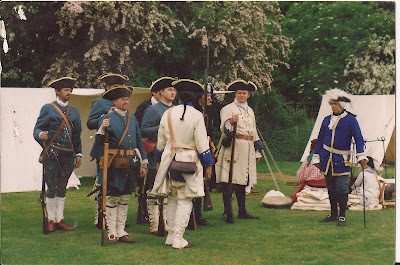 Forgive me all this nostalgia - I have a new scanner so I am enjoying revisiting my old photos...these are of redcoat unit the 36th. They were all pretty young compared to us. The 36th didn't fight in America but we weren't worried about that as they were a great group. Interestingly they were an Independent Company until they bought the lace! 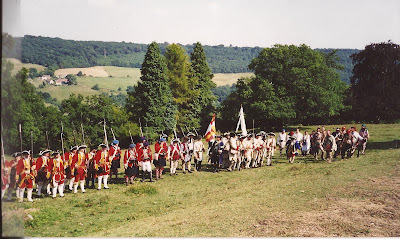 Again at Bath - I am on the extreme right. You can see a couple of other 'looks' for the Marines - in small clothes. 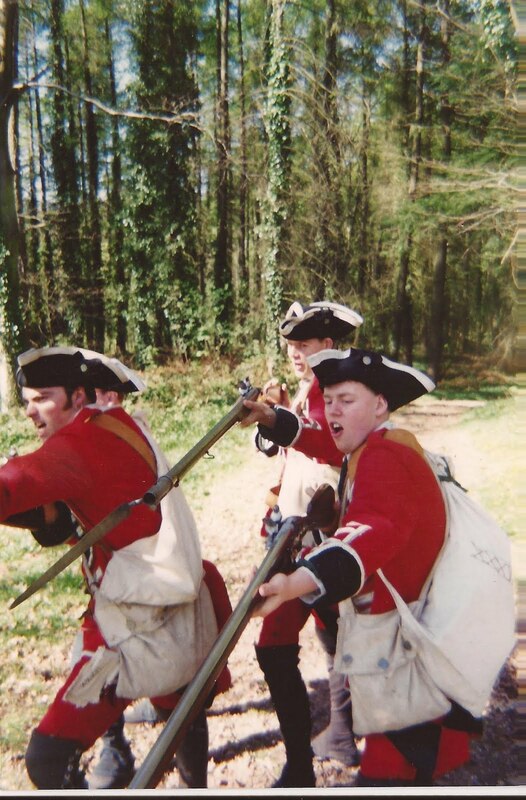 Back in the day when I used to run a F&I reenactment group over here I was always experimenting with different looks to try and create something authentic but not expensive to attract people into the group - here's a 'look' for the Compagnies franches de la Marine which was cheap and practical - could be worn with a bonnet a la dragon or tuque. 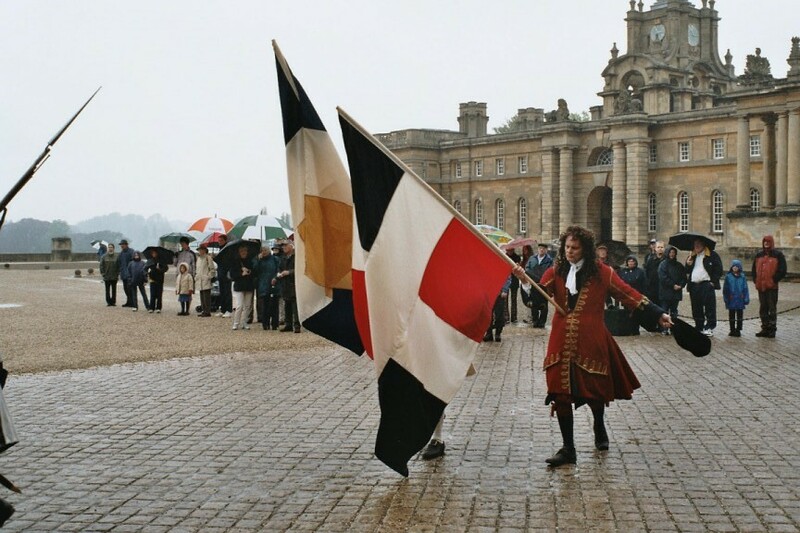 Photo of me in 2004 Blenheim Palace recreating 1704. 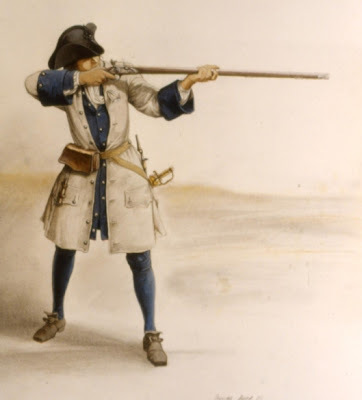 A few posts on the era of the Queen Anne's war - not a hugely popular period and one I have neglected until now but with a possible new movie and of course the 300th anniversary of some of these events such as the Hovenden Walker expedition it makes it a little more relevant. Images from around 1700 from the Wursthorn collection. 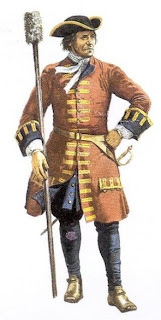 Sir Hovenden Walker's disastrous expedition to Quebec in 1711 (which saw the armada destroyed by a storm) might be another interesting campaign to wargame - as a 'what if'. 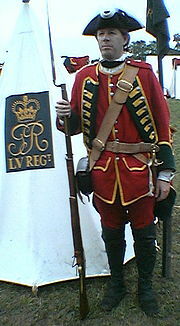 Apparently 5 of the best battalions of Marlborough's army were brought over - some 5,300 of them. 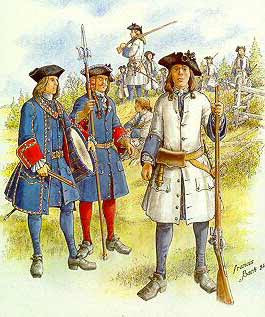 That plus sailors, marines and Iroquois... it could have been quite a force. 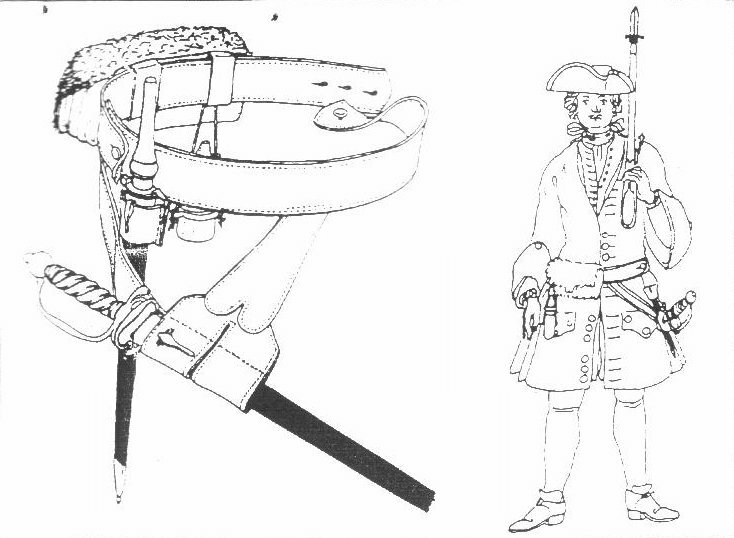 Seven transports and one storeship were wrecked and some 850 soldiers drowned...the expedition was abandoned. New French and Indian war movie? 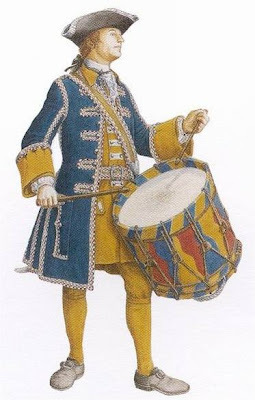 The historical drama Four Kings, about the Seven Years War during the 1700s, will shoot this summer in Toronto with Fraser playing Colonel Francis Nicholson, the Englishman who finances the war in order to create a utopian society in Canada. Czech sutler purveying all manner of Native items - sashes, Trade Goods, silver - check them out. 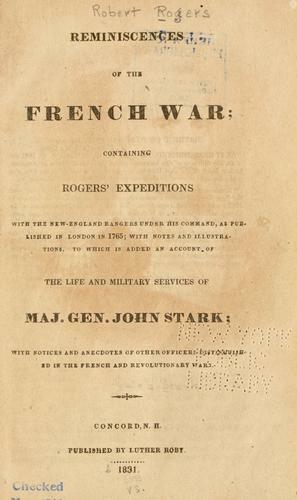 This battle thought to be by some as the opening salvos of the American Revolution took place today in 1771. Wiki. The central siege of the 1794 campaign came at Fort Recovery (here's the replica in Ohio) which the Native confederacy failed to take. Wayne's Legion were very adept at making forts along their route in imitation of the Roman fortified camps. As someone interested in the frontier period in American history I was looking forward to these woodland indians from Italeri and whilst they aren't perfect they certainly do the job of recreating the allies of the British in the American Revolution. 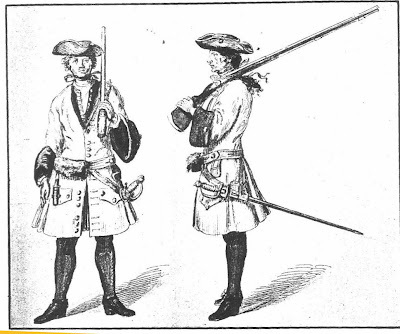 OK so the sculptor doesnt really know anything about ballheaded clubs - that much is evident - and the gunstock clubs are a little too prevalent showing the influence of the 'Mohicans' movie on the choice of weapons. A lot of the poses are kind of strange - one holding a scalp aloft being one and some very odd waving stances being some that come to mind. 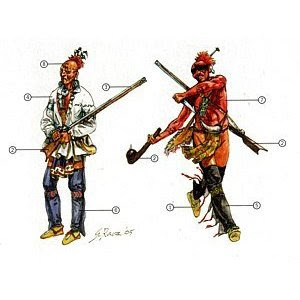 None of the warriors look like they know how to fire a musket which would be erroneous in that most woodland indians were expert marksmen and none are using the bow or woodland spear. 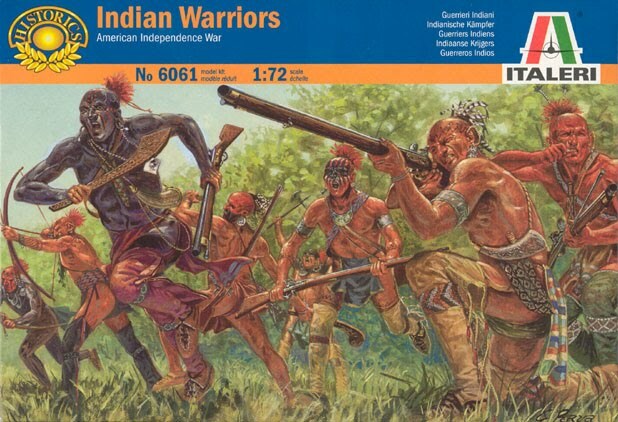 It is another case of the box art being so much better than the contents but they are worth a paintjob and coupled with the other Revolution or Seven Years war figures enable people to recreate battles of the French and Indian wars pretty cheaply. Imex are planning releases of Mohawks and Rogers Rangers to add to their already impressive range of settlers, wagons and stagecoaches in their American History series - one set includes wigwams and camp equipment for 'Eastern Friendly Natives'. If I was to game Fallen Timbers I guess I would use these American-made figures (20mm). 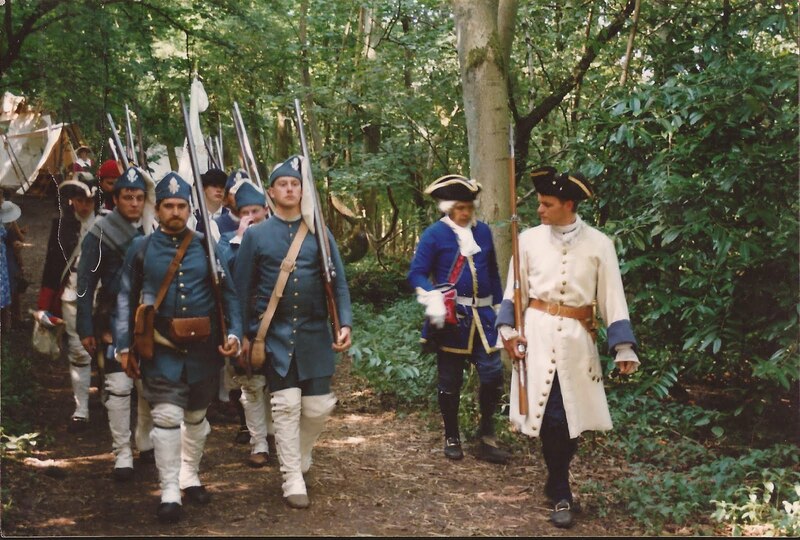 They do Revwar and 1812 (as well as the Northwest Territory war) and from the photos they look like attractive castings. Anyone out there got photos of the Wayne's Legion figures and Indians etc? 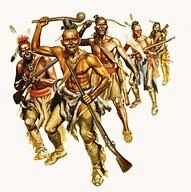 There's just been a poll started on the Mocassins group about people wargaming the Fallen Timbers campaign (1794). I'd like to see this period get more focus so I mention it in case there's someone reading this who might do it. About two o'clock on the morning of the thirty-first of July, the gates were thrown open in silence, and the detachment, two hundred and fifty in number, passed noiselessly out. They filed two deep along the road, while two large bateaux, each bearing a swivel on the bow, rowed up the river abreast of them. Lieutenant Brown led the advance guard of twenty-five men; the centre was commanded by Captain Gray, and the rear by Captain Grant. The night was still, close, and sultry, and the men marched in light undress. 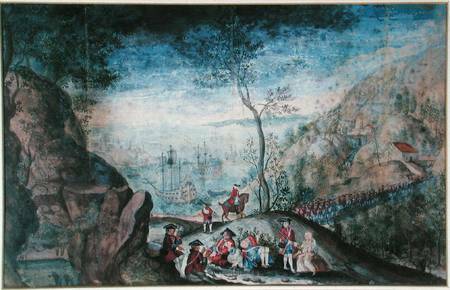 On their right was the dark and gleaming surface of the river, with a margin of sand intervening, and on their left a succession of Canadian houses, with barns, orchards, and cornfields, from whence the clamorous barking of watch-dogs saluted them as they passed. The inhabitants, roused from sleep, looked from the windows in astonishment and alarm. An old man has told the writer how, when a child, he climbed on the roof of his father's house, to look down on the glimmering bayonets, and how, long after the troops had passed, their heavy and measured tramp sounded from afar, through the still night. 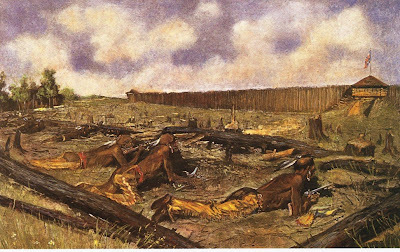 Thus the English moved forward to the attack, little thinking that, behind houses and enclosures, Indian scouts watched every yard of their progress — little suspecting that Pontiac, apprised by the Canadians of their plan, had broken up his camp, and was coming against them with all his warriors, armed and painted for battle. 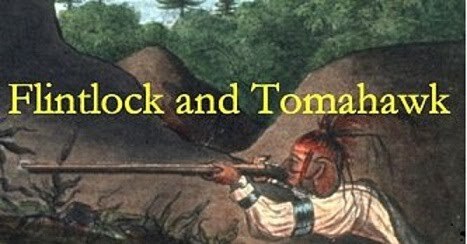 A mile and a half from the fort, Parent's Creek, ever since that night called Bloody Run, descended through a wild and rough hollow, and entered the Detroit amid a growth of rank grass and sedge. Only a few rods from its mouth, the road crossed it by a narrow wooden bridge, not existing at the present day. Just beyond this bridge, the land rose in abrupt ridges, parallel to the stream. Along their summits were rude intrenchments made by Pontiac to protect his camp, which had formerly occupied the ground immediately beyond. 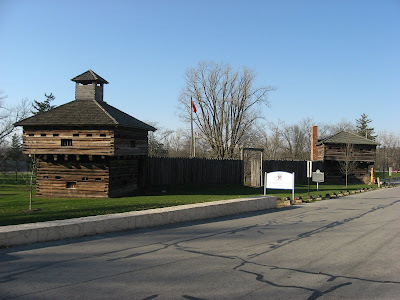 Here, too, were many piles of firewood belonging to the Canadians, besides strong picket fences, enclosing orchards and gardens connected with the neighboring houses. Behind fences, wood-piles, and intrenchments, crouched an unknown number of Indian warriors with levelled guns. They lay silent as snakes, for now they could hear the distant tramp of the approaching column. The sky was overcast, and the night exceedingly dark. As the English drew near the dangerous pass, they could discern the oft-mentioned house of Meloche upon a rising ground to the left, while in front the bridge was dimly visible, and the ridges beyond it seemed like a wall of undistinguished blackness. They pushed rapidly forward, not wholly unsuspicious of danger. A battle of the siege of Detroit that might be interesting to recreate in miniature is this battle - sometimes called Parent's Creek, when an Anglo-Colonial force of about 280 attempted a sally to attack Pontiac's camp and was ambushed in the dark by a large body of Indians supposedly warned by a perfidious Canadian. The patrol leader Dalyell was killed in the action which also featured the legendary Robert Rogers. Anyone have an order of battle for this skirmish? 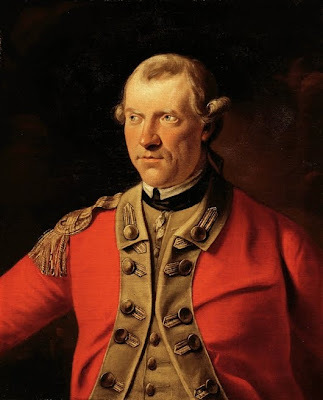 The image from here is supposedly Captain James Dalyell - presumably the same gent? Painted by Cosmo Alexander (1724–1772). 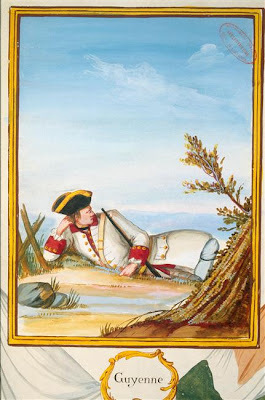 I've always thought the siege of Detroit would make a good old style Hollywood indian flick . Bushy Run Battlefield walk in the footsteps of history. This site looks like it has some fine pieces. I need some armbands really - the ones here are reasonably priced - check them out. 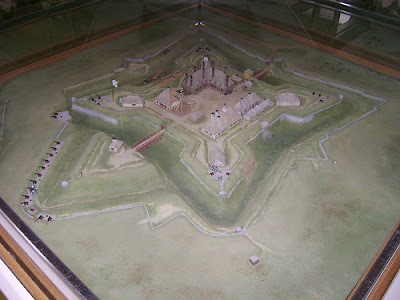 Started today in 1763 with an attack on Fort Detroit. Wiki. Image is the largest I can find of it - its by Ronald Embleton. Who remembers this Alan Alda comedy? He plays a history professor who writes a book that gets made into a film. It's a movie about the making of a movie about the Revolutionary battle of Cowpens and the effect it has on various individuals in the town and among the cast. Also stars Michelle Pfeiffer and Michael Caine (as Tarleton). Reenactors are featured in this scene as they try and influence the production... would make an ideal companion to the Patriot! Michael has written a schollarly book on the revolutionary war. He has sold the film rights. The arrival of the film crew seriously disrupts him as actors want to change their characters, directors want to re-stage battles, and he becomes very infatuated with Faith who will play the female lead in the movie. At the same time, he is fighting with his crazy mother who thinks the Devil lives in her kitchen, and his girlfriend who is talking about commitment.